First, my apologies if this is not the proper place for my question. Can anyone suggest an artist or a title? Any help is appreciated, and sources are helpful as well. look like hogarth paintings.. but im not really sure. just say its hogarth or better yet look for a signature somewhere on the painting. Straight Edge Ryan, at the beginning I didn't know what kind of ship was that, but know I'm almost sure it is a galleon, and you are right... both Spanish and English are very much alike. As far as the coat of arms, I've tried all belonging to U.K. and the Commonwealth as well and no results so far. Now I'm looking something different, with the nobility and guilds. I know nothing about heraldry, but I think they are a lion and a chained dog, so I rather consider it may have to do with nobility. The painting on the wall I thought it was a portrait of... ¿Drake?, but I haven't found it either. For the clothes that man is wearing I guess it could be made in the late XVII C., whereas the characters in the painting look to me like in the XVIII C., under the reign of one of the Hannover kings. The gothic archs of the window I believe could be either Spanish or English, so I couldn't go any further on that hint. Well, as you see I know nothing at all, and even though there's nothing I can take for sure, I must admit I'm having a great time in this quest and I'm learning lots of things. As I told you this all began just for curiosity, because it isn't really important, it is not the original piece of work but a simple copy on a wall in a humble living-room, but it's interesting... and it's beautiful. I really appreciate your help and your time spent. Thank you again. I'm pretty sure that's no galleon. Consider where the waterline would be on that thing. One cannon deck, three masts.. from what i can tell you're looking at a full rigged frigate. //Edit: The ship looks like it could be a sixth rate ship of the royal navy, since it looks to have about 24 cannons. 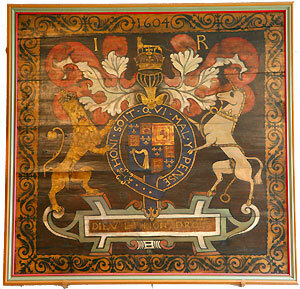 The coat of arms over the fireplace looks like it has a horse and a unicorn on it, bearing a striking resemblance to the british royal coat of arms. Last edited by Slash; February 15th, 2010 at 04:53 PM. well, the baton sinister is English/British from what I could find. As far as the coat of arms, I've tried all belonging to U.K. and the Commonwealth as well and no results so far. This is the closest one I've found, it's on the governors palace, in Williamsburg, Virginia of all places. A slight variation of the House of windsor. Last edited by karma militia; February 17th, 2010 at 08:48 AM. I think i found the model ship... Or one pretty damn similar. 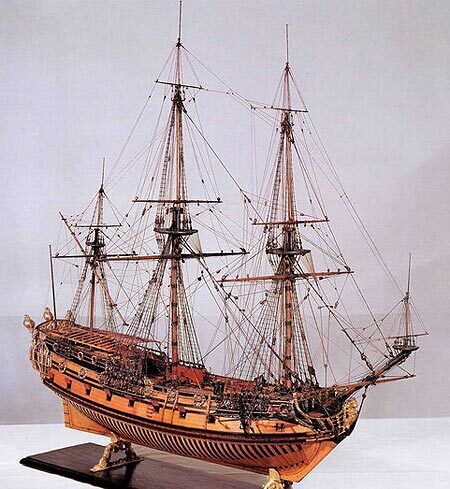 A 48-gun (fourth rank) ship of the British Admiralty, from about about 1695. The scene looks very british. The painting is much later than Hogarth, and the painting is "historical" in theme. I'd suggest its either late 19thC (in which case its probably british), or, more likely, early 20thC - think american book/magazine illustrators. My money would be on someone like Howard Pyle, Dean Cornwall, NC Wyeth... stories of 18thC naval adventure, pirates, and so on, were a big thing in the early 20thC. (I'll bet Elwell can identify it, or give some good suggestions). I agree, It's probably a retrospective imagining of some important event. It's possible that ship is "HMS Sussex". It sunk in 1694, with about 10tonnes of gold onboard. It was a British navy ship, last moored in Spain, and it was redesigned for better stability after the accident. After a short stopover in Cadiz, the fleet entered the Mediterranean. On 27 February a violent storm hit the flotilla near the Strait of Gibraltar and in the early morning of the third day, HMS Sussex sank. All but two "Turks" of the 500 crew onboard drowned, including Admiral Wheler, whose body, legend has it, was found on the eastern shore of the rock of Gibraltar in his night-shirt. Besides HMS Sussex, 12 other ships of the fleet sank. There were approximately 1,200 casualties in total, in what remains one of the worst disasters in the history of the Royal Navy. karma, you've done a great work! I'm now trying with the fifth rate, but they are all very similar. Tomorrow I'll go on with yours. Thank you very much.